with a US made Microinverter, (Enphase) to deliver the most production for your solar dollar! Here are just a few of the reasons we have made Sunmodule™ our choice of solar panels for every installation. SolarWorld has been manufacturing solar in America since 1975. As America’s solar pioneer, SolarWorld achieved many of the industry’s key milestones. The company was first to offer a 25 year warranty and the first to install a 1 MW system. SolarWorld produces a solar panel in the U.S. every 20 seconds – enough to equip 107,250 homes with solar each year. SolarWorld combines all stages of the photovoltaic value chain, from the raw silicon material, to the solar cells, to the solar panels. With over 1,250 employees in America and growing, SolarWorld is committed to creating and sustaining American jobs. 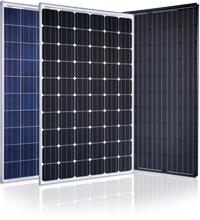 SolarWorld’s industry leading 25-year linear warranty guarantees more energy production over the life of the panel compared to most manufacturers. Their 10-year product workmanship warranty provides added insurance for your investment. A warranty is only as good as the company that backs it. SolarWorld has been in business for over 35 years. Because SolarWorld produces the highest quality, They can guarantee the best performance. 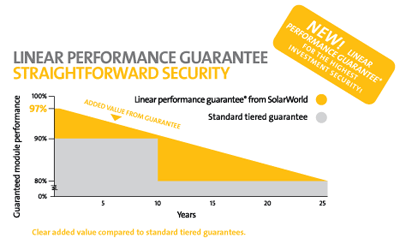 That's why SolarWorld is the first solar company to offer a 25-year linear performance guarantee [PDF 176KB] and a 10-year product workmanship warranty. According to their guarantee, the actual power of a new module cannot deviate from the specified rated power by more than 3% during the first year; and afterward, the power will not decrease by more than 0.7 percent of the rated power per year. So at year 10, the Sunmodule’s capacity is guaranteed to be at least 90% of the nameplate as opposed to the industry standard guarantee of 80%. As the largest and most experienced solar manufacturer in the USA, SolarWorld's Sunmodule solar panels are designed and manufactured to the highest standards of quality, performance and durability. The mono-and polycrystalline products from SolarWorld come in variety of sizes, making them suitable for all applications – from a residential rooftop to a large-scale facility. Sunmodule solar panels are now available with the 2.5 frame. For SolarWorld, being made in America means more than simply assembling foreign components in the USA, which does little to benefit the economy. By carrying out the entire PV module value chain in the USA , we are creating American manufacturing jobs not only at our factories but at our suppliers’ factories as well. SolarWorld is investing over $500 million to expand US-based manufacturing, which generates hundreds of millions of dollars each year for American workers, goods and services.